Not all homes prefer to utilize carpet for their flooring, and instead, homeowners turn to quality hardwood flooring. Not only is it a more elegant option for home flooring, but hardwood floors are durable and can even help reduce the ambient noise inside a home. Unfortunately, unlike carpet or tile, hardwood flooring can easily become scratched or scuffed, and cleaning it can become a real hassle. Finding a dedicated company that knows how to clean hardwood flooring properly can be even more challenging. Rather than struggle to find a dependable and affordable hardwood flooring cleaning company, there’s a better option in Mobile, Alabama for your home. Carpet Cleaning Nurse's Touch isn’t just the best choice in local carpet cleaning services. We are your local floor cleaning experts. We have the experience and the crew you can trust to give your hardwood flooring a better cleaning, all without damaging or discoloring your floors with low-quality cleaning solutions. Because we’ve been servicing more area homes for such a long time, we’ve built a reputation for being fast, affordable, and efficient with all of your floor spaces. And when it comes to cleaning hardwood flooring, we bring that same level of excellence and lower pricing to you each time. We believe that complicated hardwood flooring processes are all show and no substance. The difference when you hire us is a clear one. By relying on a tried and true mild alkaline floor cleaning solution, we can target hardwood directly. This isn’t a cheap store purchased cleaning agent; we only use true professional grade cleaners by area floor cleaning experts. The results speak for themselves, and it isn’t something that can be achieved with low-quality mopping solutions or tile cleaners. The reason we continue to use our best hardwood floor cleaner despite everyone else turning to gimmick products is that it continues to clean deeper and more efficiently, all without warping the wood panels or causing discoloration. And when maid services or lesser quality floor cleaning companies simply use a mop and bucket full of dirty water, our team uses low-speed mechanized buffer tool that achieves a superior finish each time. Other companies may charge higher prices, but they simply don’t get the results that we do. Once our dedicated cleaning agent becomes agitated, it soaks up any remaining dirt, dust, oil, and scuff marks. Once the cleaning solution takes hold, it breaks all of these issues down, which is then quickly scrubbed away with our buffer. As a result, your floors quickly look brand new again with a freshly cleaned scent and a shimmering polish that lasts. Our best cleaning method makes it possible to remove even the toughest spots and stains from your home’s hardwood flooring. Even if you have cooking oil splatters in the kitchen or paint splatters from a recent service call, they’re no match for our team. With a clean high-quality cotton buffing pad and a patented alkaline floor cleaning solution, not even red wine and coffee stains are a match for us. Other companies may try and use the same steam cleaning machine that they use on carpets on hardwood floors. While steam cleaning is a powerful and efficient way to get lingering stains off of any hard surface, steam can warp, fade, and even destroy hardwood. This is an even bigger concern when they use the same carpet cleaning solution on hardwood panels, leaving them bleached and with a soapy film that just doesn’t seem to come off. 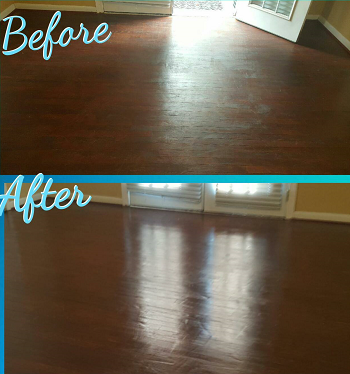 More homeowners in the greater Mobile area know that we’re the best choice in professional hardwood floor cleaning. Unfortunately, many are still left unconvinced, especially once they know how low our prices are. That’s why if you’re still not sure that our best quality hardwood cleaning system is right for you. We will even give you a free no-obligation quote to homes within a 25-mile radius of our team. This way you can hire us with confidence knowing that you’re getting the best deal in town by a company that cares about more than just taking your money. Our team understands just how expensive hardwood flooring is, and that’s why we’re always careful to use the safest process possible. If you’re tired of overpaying for poor quality cleaning that leaves your hardwood floors damaged, then it’s time to call us. With lower pricing and a better quality of hardwood cleaning solutions, you can’t go wrong when you choose us. Call today for your free quote and get the cleaning quality you deserve!